International Waffle Day, which originated in Sweden, is celebrated in the U.S. on March 25th. There is a separate National Waffle Day, celebrated on August 24th, that was originally created to honor the waffle iron. The net of it is, you can celebrate a waffle holiday twice a year! Prepared sweet or savory, they can be served at breakfast, lunch or dinner. In different parts of the world, waffles are topped with confectioners’ sugar, honey, jam, even peanut butter. But in the U.S., what are waffles without maple syrup? And what’s with the different types of maple syrup? Because maple syrup is tapped in the winter, it has traditionally been seen as a winter flavor. But just like honey and sugar, it can be enjoyed year-round in recipes from cocktails to salad dressings and marinades to desserts. If you’re confused by the four grades of maple syrup (A Light Amber, A Medium Amber, A Dark Amber and B) here’s an explanation of the different types. Chicken and waffles. 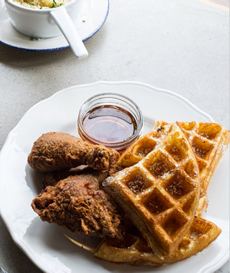 Photo courtesy Daniel Krieger | Sweet Chick | Brooklyn. In brief, at the beginning of the season, the syrup runs light in both color and flavor, and is called Grade A Light Amber. By mid-season it’s Grade A Medium Amber, followed by Grade A Dark Amber and Grade B. At the end of the season, it’s the strongest in flavor and color, commercial grade syrup. 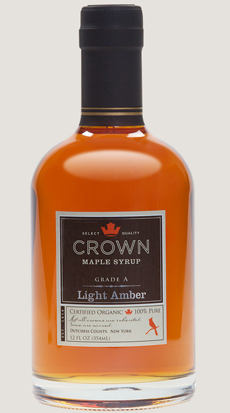 We recently received a bottle of Crown Maple syrup, certified organic. It is produced by Madava Farms, a family business in the historic Hudson River Valley of New York (Dutchess County). There, 800 acres of century-old, sustainably managed groves of sugar and red maples enjoy perfect soil and ideal seasonal weather conditions to produce a superior sap for maple sugaring. But production is a key determinant of quality. Far from the old primitive sugar house, Crown premium maple syrup is made at the most advanced maple syrup production facility in the country. The pristine sap collected from the maples is cooked using the latest in green, organic production techniques to produce syrups of exceptional quality. As you can see from these tasting notes, different grades pair better with specific recipes. Tasting Notes: Flavors of popcorn, vanilla bean, roasted nuts, salted caramel and brown butter. Although light in color, the body has a pleasing weight and depth, with a sweetness and finish that lingers. Uses: Pair with salty flavors, for example glazing pork belly or bacon. Try it in cocktails with whiskey as a base: Replace the muddled sugar cubes in an Old Fashioned. Use it as a substitute for palm sugar in Thai recipes. Tasting Notes: Aromas of gingerbread and roasted chestnut with flavors of rye, butterscotch and spice. Uses: Pair with baked breads, chocolate and ginger cookies and heavier spirits—barrel-aged bourbons or peaty, smoky Scotch. Use as a topping for chocolate or vanilla ice cream. gift giving. Photo courtesy Madava Farms. Tasting Notes: The flavor and aroma are similar to Medium Amber, but the syrup has more weight, depth and concentration. Aromas of coffee and cocoa beans are present, along with flavors of brown sugar and toasted almond. Uses: Use instead of other sweeteners in coffee, and as an alternative to honey as a condiment for cheeses. Tasting Notes: A robust maple syrup with a great depth of flavor, richness and a bright finish. Uses: For cooking and baking. The richness shines through even the boldest of food pairings. A 12-ounce bottle, gift boxed, is $16.95; a samplers of all three is $59.95; and a “petite trio” of three small bottles (1.7 ounces each) is $15.95. An 12-ounce bottle of Extra Dark Syrup for Cooking is $27.95. A 10-ounce bag of maple sugar (see below) is 10.95. Buy them online at CrownMaple.com. The Ur-Waffle. Before there were modern waffles, there were the rustic hotcakes of the Neolithic Age (ca. 6000 B.C.E. to ca. 2000 B.C.E.). Made of cereal pulps, they were cooked on heated stones. Honey is as old as written history, dating back to 2100 B.C.E., where it was mentioned in Sumerian and Babylonian cuneiform writings, the Hittite code and the sacred writings of India and Egypt. We don’t know when man first decided to unite honey and hotcakes, but here’s the honey history. The Waffle Iron. The waffle iron—enabling pancake-type foods to be turned into textured waffles—was created in the 1200s, when a [presumably] pancake-loving craftsman combined cooking plates that reproduced a pattern of honeycombs. The Electric Waffle Iron. The electric waffle iron was introduced in 1911 by General Electric. Types Of Waffles. There are at least 11 varieties of waffles: American, Belgian/Brussels, Liège, Hong Kong Waffle, Krumcake, Malt, Pizzelle, Potato, Soft, Stroopwafel and, yes, Toaster. Take a look at the types of waffles. Here’s the complete history of waffles. Here’s a recipe from Crown that uses maple sugar instead of table sugar for even more maple flavor. 1. PREHEAT waffle iron to desired temperature. 2. COMBINE all dry ingredients in large mixing bowl and set aside. 3. BEAT eggs in a separate bowl; stir in milk, butter and vanilla. Pour milk mixture into the flour mixture; beat until blended. 4. LADLE batter into heated waffle iron and cook until golden brown; serve immediately with maple syrup. Maple sugar is made from the sap from the maple tree, as opposed to the juice of sugar cane, from which table sugar is made. It has the same strong maple flavor and aroma as maple syrup. The sap is boiled until almost all of the water has been evaporated; the remaining product has crystallized. The sugar can be sold in large blocks, molded into small shapes or simply ground into a granulated version that can be used like regular sugar. Maple sugar can be used in the same way as cane sugar: in coffee, tea, baked goods and cocktails. It adds more complexity and richness than cane sugar. However, is almost twice as sweet as regular sugar, so when replacing cane sugar, you need to reduce the amount. Try using one-third less, and adjust to taste.